News - Services Included with NL-B Lifting Magnets Purchases - Armstrong Magnetics, Inc. The time you place an order for NL-B lifting magnets is not the end of the transaction between Armstrong Magnetics and you, it is the starting point of our service for you. The relationship between us would last throughout the total lifetime (10 years according to the nature of permanent lifting magnets) of the purchased NL-B permanent lifting magnet. After you place an order for NL-B permanent lifting magnets, or even before that, we would like to discuss with you about the feasibility of using the model of NL-B permanent lifting magnet that you ordered or interested in for your lifting jobs prior to shipping the product. Our years of sales experiences tell us that some customers	have incorrect concepts about how to use permanent lifting magnets safely. Many of them think that NL-660B, for example, can lift 660 lbs of any iron load of any shape, or any thickness, or under any other conditions. Our sales representatives would call customers to investigate the actual conditions of the lifting operations, or request them to fill out a form of Lifting Application Data in order to make sure the NL-B permanent lifting magnet they ordered is the right and safe choice. When we are confident that the ordered NL-B lifting magnets would work well for the customers' lifting operations, we would then immediately ship them, together with an Instruction Manual and Test Report, packed in wood crates or cardboard boxes. Both packages are filled with hard polyfoam protecting the NL-B lifting magnets against possible violent impact during transit before they reach the customers' doors. The purchase invoice of the NL-B permanent lifting magnets you receive would include crucial information. Besides the models, quantity and prices, it indicates the Invoice Number and the Product Serial Number of the NL-B permanent lifting magnets shipped. The Invoice Number and the Product Serial Number are indispensable for the Limited Lifetime Warranty. 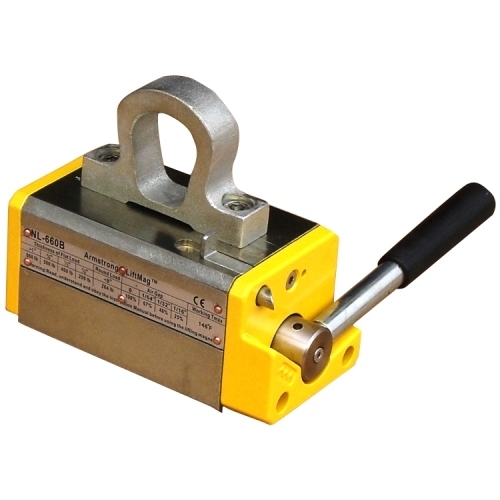 If there are any problem with the NL-B lifting magnets, the customer must inform us of the invoice number and the product serial number which is also stamped at the top of the lifting magnet. We can then check the record of the purchase. The stamped product serial number is unique for the lifting magnet and also identical to that in the related invoice. The stamped product serial number at the top of the NL-B lifting magnet must be kept clear. If it is scraped off or disappeared by any other means, the NL-B permanent lifting magnet would lose the warranty. During the period of 10 years as of the invoice date, customers will receive free service for repairs and replacement for the NL-B permanent lifting magnets for any defects in materials and workmanship. So you don’t have to worry about any cost for that. Of course, we would like to resolve any problem of the NL-B permanent lifting magnets even though they are damaged by careless operation or by an accident.